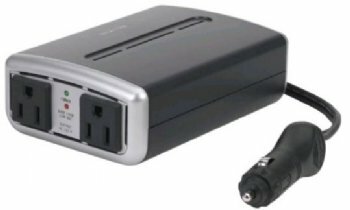 Use power inverters as if they were a wall outlet in your vehicle, you will still need your laptops AC Adapter. Keep in mind that DC power inverters are temporary solutions to not having consistent AC power. This adapter is enough to run all but our most powerful laptop, the D9 series. To run the D9FHD or any laptop for that matter your absolute best choice is the Pure Sine wave 1000w inverter we sell. It avoids the detrimental sine wave clipping all inverters suffer from unless otherwise stated. This is also one reason why you should always attempt to go for more wattage in your inverter than is stated on your AC adapter. Use a non pure sine wave adapter such as this for recharging your battery or for periodic use from a cigarette lighter or 12 volt battery. The Pure Sine wave inverter may seem more costly but is cheap insurance against the cost of replacing your AC adapters every few months. So in a nut shell, need power from your vehicles once in a while or need to charge your battery on the way from one location to another? use the 300W inverter. Need a solution for every days usage from a DC power source? Use the more powerful 1000w inverter that does not clip the sine wave and stress out your AC adapter. Keep in mind that if your laptop is off and you are just recharging the 300w should be just fine, the sine wave issue enters when you try to run your laptop while plugged into a battery or your autos DC adapter plug.